Like with anything else we make while trekking about the great outdoors, practice makes perfect. Some bushcrafters get it right away and we sincerely admire these men and women. 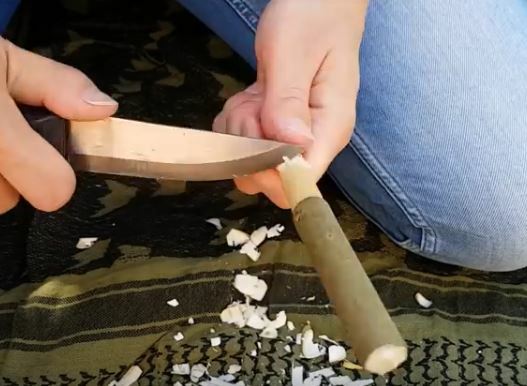 However, for those of us who are a little more simple, who need step by step instructions, look no further than to a Swedish lady called Emelie who shows us, first up, how to make a survival whistle! You never know when one of these babies will come in handy. If you have kids and you’ve been out in the wild long enough, a whistle – made by your or their hands – could be a life-saving extra that hangs around a neck! If you are lost just blow it long and loud. Someone will eventually find you! Go over to the next page and watch as Emelie, out in the woods, shows us how to make a whistle with nothing but a sharp tool.